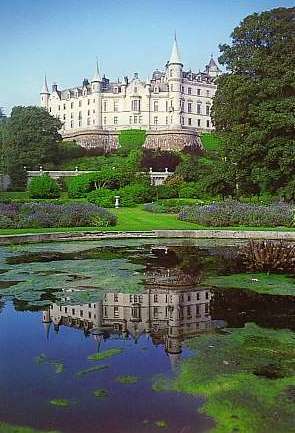 Dunrobin Castle and grounds, near Golspie, Scotland. Photographic Print of Dunrobin Castle and grounds from Robert Harding . 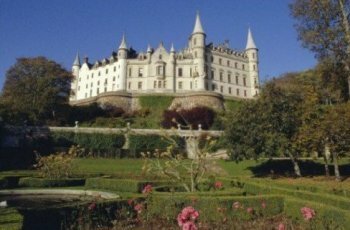 Dunrobin Castle: The fairy-tale-like castle facing the North Sea a mile or so north of Golspie in Sutherland is Dunrobin Castle. The Sutherland family can trace their ancestry back to Freskin of Moravia, and one of his descendants, Hugh, migrated to Sutherland in the days of William the Lion, with the 1st Earl of Sutherland being created in 1235. The oldest part of the castle dates from about 1275 but it was from the strong additions made at the end of the fourteenth century by Robert the 6th Earl that the castle takes its name. He had married the daughter of the infamous Wolf of Bedenoch in 1389 and had to have a fitting and impressive home to offer her. The ninth Earl inherited a mental weakness and was considered not capable of fulfilling his duties, so was placed in the care of his sister, Lady Elizabeth, until he died. There followed a wrangle over who should inherit -- his sister or Alexander, a half-bother. Lady Elizabeth won --but it wasn't a decision Alexander was prepared to accept. Local skirmishes took place all over Sutherland until Alexander was killed in one of them and his head borne back on a spear to be displayed on a turret at Dunrobin! Lady Elizabeth had married a Gordon and insisted on keeping her married name so for the next few generations the Sutherland Earls were Gordons! Some of the would-be competitors for the Earldom who had resented a woman succeeding weren't content to let matters rest, however. When her grandson succeeded Lady Elizabeth, the 'Good Earl John', as he was called, was in exile for taking part in Huntly's Rebellion, but returned to his home in 1567. With his wife and young son he accepted an invitation to dine at Helmsdale Castle. Young Alexander went out hunting and returned to Helmsdale to find his mother dead and his father dying. With his last breath Earl John warned his son not to drink the wine that Lady Isobel Sinclair was offering. At one fell swoop she had planned to be rid of all who stood between the earldom and her son -- but her son, who had also been Out hunting, returned and helped himself to a glass of the poisoned wine! The Sutherlands were always strong supporters of the Government in the Uprisings. Dunrobin was captured by Bonnie Prince Charlie's supporters in 1746 but the Earl escaped to turn the tables on them and recapture the castle. To Dunrobin belongs the distinction of being the last castle to be taken in war. Again the Earldom passed to a female, perhaps the best known Sutherland of all, for the Countess Elizabeth was only a year old when she inherited. Again there was the inevitable dispute, but the House of Lords decided in her favour. Most of her early life was spent out of Scotland, her husband being appointed as Ambassador to France. One of the tales told of her recounts her exploits smuggling in clothes to Marie Antoinette in prison. She and her husband, who was ultimately created 'Duke of Sutherland' were the instigators, with the best of intentions as is now acknowledged, of what became known as the infamous Sutherland Clearances. In its time the castle has been used as a Naval Hospital during the First World Wax, then later as a boys' boarding school. The ghost who haunts Dunrobin was a daughter of the fourteenth Earl. In the 1600's Margaret fell in love with someone considered not at all suitable, and strongly resisted her father's attempts to marry her off to the favoured suitor. Foiled in an attempt to elope, Margaret was locked up in the attic. Her maid was allowed to tend her however, and she offered to act as a go-between. On a set night she arranged for Margaret's lover to be at the foot of the wall with horses at the ready, while she smuggled in a rope for the get-away. But the Earl had always suspected that his daughter might try something like this and had set his own servant to spy. Just as Margaret was climbing out the window her father burst into the room. Terrified, Margaret lost her grip and plunged to her death. Her lover put a curse on the Earl and Margaret still haunts the upper corridors of the castle, sobbing and wailing for her lost love and her life' brought to such an untimely end.